I’m really not a huge fan of eggplant, and even though this recipe calls for it, I wasn’t planning to put it in. However, I happened to have some eggplant from the garden, so I decided that I might as well use it. It turned out to be quite delicious, although we didn’t really have enough eggplant in it to make it a feature of the dish. 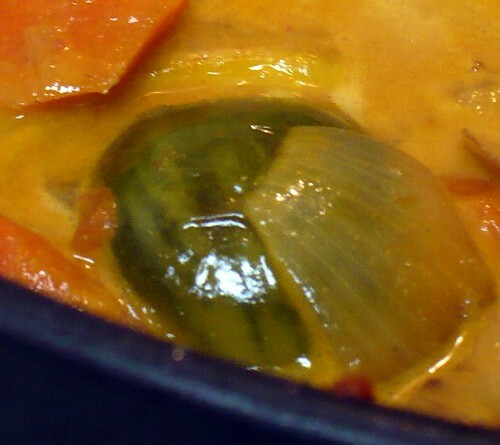 The recipe as a whole is a good outlet for a number of vegetables if you happen to have them. It originally called for okra, but I would imagine you could pretty much use any vegetable you thought would be tasty. 1. Saute each of the vegetables individually with some butter until they are just beginning to get tender and then place them in a bowl. (You can put all the sauteed veggies in a bowl together.) Toss the tomatoes in with the carrots when you cook them. 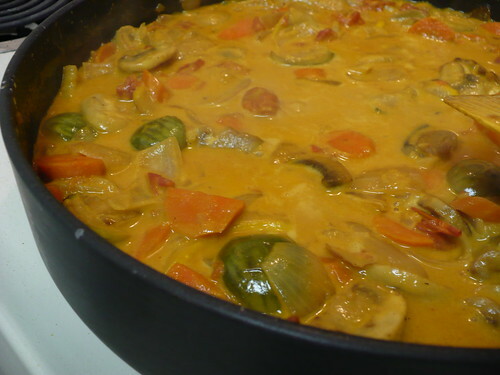 The eggplant and mushrooms can also be sauteed together. 2. Saute the onions for the sauce until they are golden brown, then add the garlic and ginger. Saute for 1 minute. 3. Add all the spices and saute for 1 minute. 4. Add back all the vegetables and add 1 tsp. salt. 5. Add coconut milk and bring to a simmer. Taste and add salt and pepper as needed. Add lime juice and season to taste again. Serve as a stew or over rice. Whew! September is just flying by! I hope you’ll excuse my lack of posting, but I’ve been running around away from the garden most of the month, so I haven’t had time to write. I think I’m going to be able to get a couple of posts written to post next week while I’m gone yet again, but don’t hold your breath! Of course, the garden keeps right on growing without me, which is a good thing. 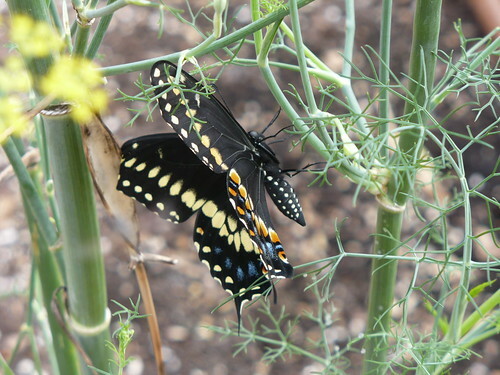 This gorgeous Black Swallowtail Butterfly was hanging out around the fennel. Not sure if it had just come out of its chrysalis or if it was thinking about laying more eggs (which seems a bit late). At any rate, it was nice to see the butterfly rather than another caterpillar for a change. The arugula is growing fast, as is pretty typical. 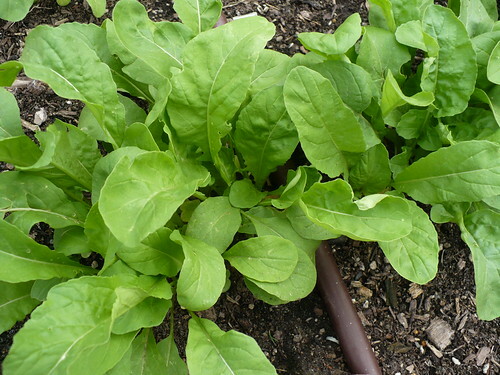 This variety has much more rounded leaves instead of the more oak-like leaves of other arugula varieties. All of the fall radishes are growing well and starting to develop the radishes. 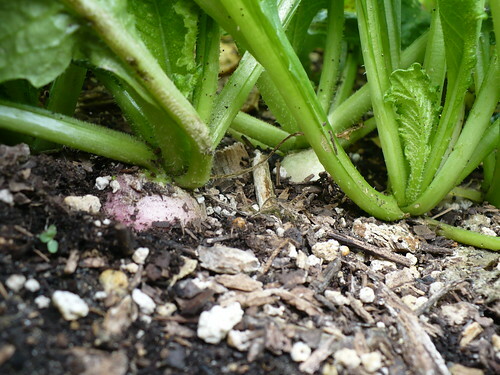 Here you can see the start of the Mantanghong Radishes. I suspect the challenge will be letting them alone to keep growing instead of pulling them too soon. 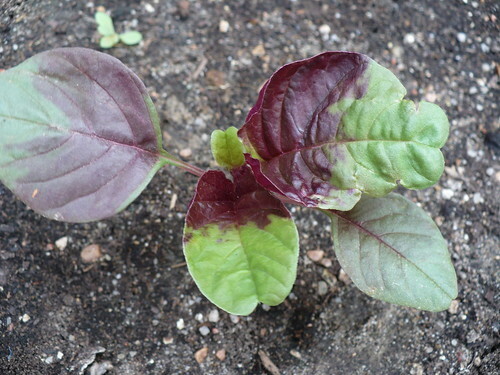 I think this Amaranth seedling is confused as to what time of year it is. 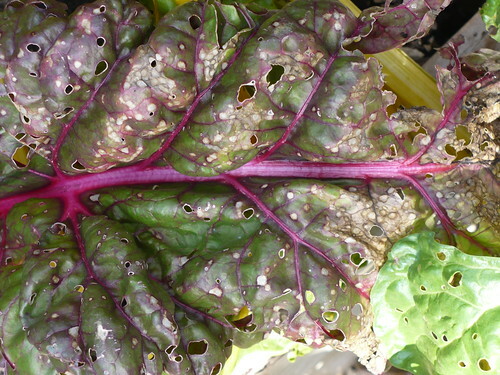 Amaranth is a summer green that doesn’t really like temperatures below 40 degrees. I wonder if I should tell it that we’re forecasted to have a low of 47 next week? Oh well, at least it isn’t likely that it will go to seed at this point. I know this is pretty much blurry beyond recognition, but I had to give you little sneak preview of what is coming for one of the posts next week. That stripey green blob behind a piece of onion is one of our ‘Kermit’ Eggplants. In case you missed it, my opinion of eggplant is that it’s a nice enough ornamental but not worth eating. So I will be posting my token effort at cooking and eating eggplant for 2010. You don’t want to miss that! How Did the Peppers Do? We have had decent pepper production this year, although I think that the break in production was more attributable to nutrient deficiency rather than the summer heat. We had some nice peppers early, then they stopped for a few weeks, and now we are getting lots of nice peppers again. It may have been both issues resulted in the smaller peppers and lesser production across the board. Giant Marconi – Good producer, but the plants got a little leggy. The peppers weren’t as large as I thought they maybe should be. Early Sunsation – This variety had much smaller peppers than last year, and they took a long time to size up. (Of course, we may not have been patient enough to wait for them to get bigger too!) The yield wasn’t great either, although better than last year, when we were trying to leave the peppers on the plant to get them to turn yellow. 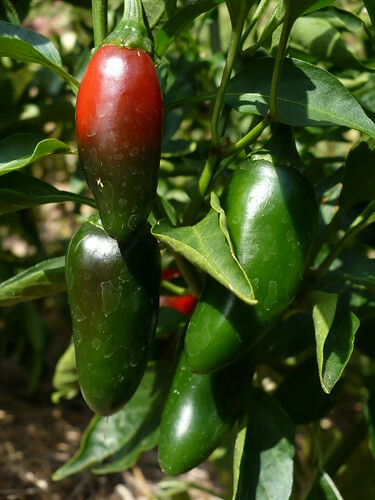 El Jefe Jalapeno – This pepper was a great producer! We had plenty of jalapenos all summer, and the size of the peppers was maybe slightly small, but very good overall. Banana – Again, smaller peppers than I expected, and a much lower yield than last year. small peppers early in the season, it hasn’t really resumed production. Maybe it requires very high fertility to be productive? Big Jim Chile – Like the Giant Marconi, this was a good producer, but not great. The peppers were all good sized though. Sapporo Hot – This Asian hot pepper was very productive! The flavor was a little more floral than a serrano would be, which was nice. We have enough dried peppers to make stirfry all winter! Yatsufusa – Similar to a Thai Chili, this pepper was both ornamental and productive. Again, lots of dried hot peppers to go around! Shishito – This sweet-hot green pepper was kind of confusing. While it was quite productive, I never really figured out what to do with it. The walls were very thin, and it always tasted kind of green and unripe. Maybe I missed out by not trying it in tempura, as the catalog suggested. Do you have any peppers that have done well this year? I just got the second round of planting in the Spinach Fall Trial done. I was out looking at the garden and thinking about when I would need to plant again, when I realized that this week was the 2nd scheduled planting for the spinach and other greens! I grabbed my seeds and labels and headed right out to get the ‘Space’ Spinach, Red and Green Saladbowl Lettuces, ‘Winter Density’ Lettuce, Elegance Greens Mix, and as a random idea some of the ‘Bleu de Solaize’ Leek seed. I thought I’d see if the leeks would be transplantable size by spring, just for fun. 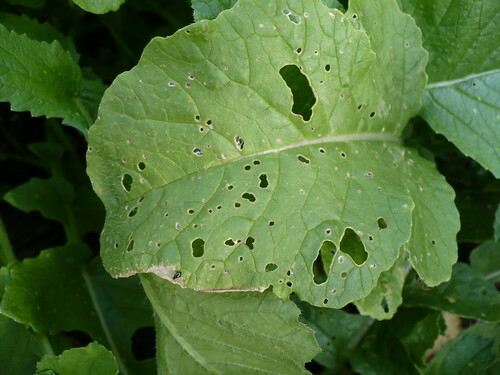 Now that the weather is getting cooler, we are starting to see a rebound in the flea beetle population, as I mentioned last week in the photoessay. You can see another one of the marauding bugs on the lower edge of this radish leaf, as well as observe the progress they made in just a few days. We sprayed all our radishes and Asian greens with neem oil this week to knock the beetles back a bit. Now for a more uplifting, less depressing photo! The peppers are loaded down and bending over after being pokey about producing earlier this year. The jalapenos are particularly productive. One of the leeks is actually starting to look like a leek! This was the very first seedling that germinated when I planted the seeds 6 weeks ago, and it is still maintaining its edge. It almost looks like a plant that is going to do something rather than a little wisp of green that maybe isn’t meant to be there. I have to say that I’m impressed with the gardening fortitude of you all, because based on the poll from last week, all but one of you have every intention of sticking with your tomato plants until the bitter end this year. I guess we are not all tomatoed out yet! In other housekeeping news, we did have about 1.25 lbs of tomatoes and 1.25 lbs of peppers from the Family of 4 Garden this week. That’s $5.63 worth, which makes our running total $221.58. Have a great weekend! Be watching for more garden results next week! How Did the Melons, Cucumbers, and Squash Do? Continuing on with the theme of how things did in the garden this year, lets take a look at the various vining crops we grew. I’m sure that most of you already have a pretty good idea of my opinion of a few of these varieties! As before, the caveat is that these results are just anecdotes, not scientific. Honey Bun Cantaloupe – This cantaloupe was selected because of its advertised “compact vine” compared to the normal cantaloupe that have huge vines. We ended up with 4 or 5 plants in the 4′ x 4′ area, and they easily stayed within their boundaries. The melons were 3-4 pounds when ripe, and the flavor was good and sweet, although not as sweet as the best of the best summer cantaloupe. So far we have had 2 melons we harvested, 2 melons someone else harvested, 1 melon that was eaten by a critter, and there are at least 3 melons on the vine right now that I know of. 8 cantaloupe from a 4′ x 4′ area is not too shabby! The plants also thrived in our hot summer, with no signs of stress at all and very little insect or disease pressure. One critique I have is that there was a very fine line between still being green/unripe and and completely ripe to over-ripe and falling off the vine. That’s what I would expect from an heirloom melon rather than a newer hybrid. I would definitely recommend this variety if you want to try growing melons but don’t have much space. Sugar Baby Bush Watermelon – Again, this watermelon was selected for its potential to be grown in a small space. It definitely lived up to that billing! I had a hard time getting the seeds to germinate, which was a little weird. (Although I think 1 or 2 seedlings may have accidentally gotten pulled as weeds.) We ended up with only 1 plant in the 4′ x 4′ area, and it didn’t even come close to filling the space. We could have easily had 2 or 3 more plants in that space. The variety was purported to produce two 12 pound melons on each vine, and we only got one melon that was probably about 10 pounds. We harvested it a little bit late, so it was a touch over-ripe. It was very sweet and juicy, but a little bit seedy. (We just aren’t used to seeded melons anymore!) I would only recommend this variety if you have a small garden and you really want to try growing a watermelon for fun (or if you have kids that would get a kick out of it)! Honey Bear Acorn Squash – This was our second year attempting to grow this variety of acorn squash, and while it definitely did better than last year (no squash bugs, spider mites, or aphids attacked it to speak of), I wouldn’t say it was impressive. This variety features small, single-serving squash, which made it even more unproductive. We had 3 plants that survived to maturity, and while they all flowered pretty much continuously, we only got 4 squash total before the plants started collapsing under pressure of borers in early August. The plants were also huge (for a supposedly compact vine) and sprawled all over into the aisles. So huge plant, less productive than the melon, and with small squash? Not a winner in my book. I haven’t eaten one yet, but it would have to be the best squash I’ve ever eaten to change my opinion. Suhyo Cross Cucumber – This was the cucumber in the Asian garden. We planted it later than average because we were waiting for all the spring veggies to finish up. After it finally quite raining in June, it took off and grew very quickly. We had our first cucumbers to harvest in early July, and then they didn’t quit until the plants keeled over in early August. We had a huge harvest of cucumbers for about 3 weeks, and then the plant pretty much quit producing. 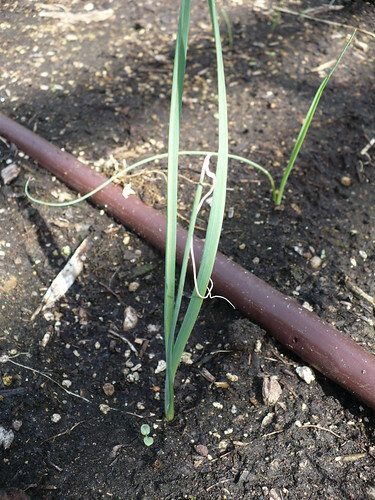 The cucumbers are long and can be crooked when grown on the ground (not trellised). Good tasting, but nothing spectacular. This plant was huge, so not a great option in a small space unless you are going to use a trellis. Diva Cucumber – We used this smaller slicing cucumber in both the SmartPot and growing in a tomato cage in the Family of 4 Garden. I’d grown this one before, 6-7 years ago, during an internship and didn’t like it then. I don’t know why I decided to grow this one instead of one I knew I liked. Maybe I thought it deserved another chance? This plant was also a huge plant, but it wasn’t productive enough to justify its existence. It took forever to start setting cucumbers and never produced very many. The cucumbers weren’t as tasty as Suhyo Cross either. Not recommended. Ever. Did you try any vine crops this year? Did any of your squash outlast the vine borers?